Use Rapid Set 25 lb. Mortar Mix for repair and formed work. The crack-resistant, non-shrink formula is designed for strength and durability, and it works very well on overhead and vertical applications. B.I.G Extra is a dry mix cement parge specifically designed to enhance the appearance of cast-in-place concrete walls. B.I.G Extra hides surface irregularities such as cold joints, colour variations, and form distortions. B.I.G Extra can also be used to disguise hair line cracks and honeycombs. 25 lb. 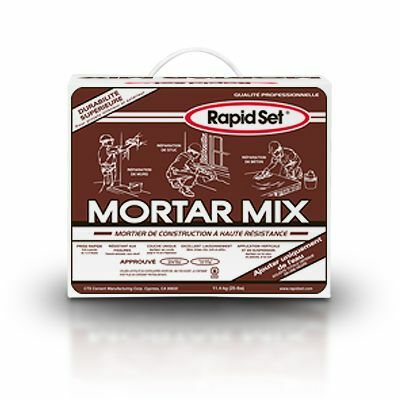 Mortar Mix Use Rapid Set 25 lb. Mortar Mix for repair and formed work. The crack-resistant, non-shrink formula is designed for strength and durability, and it works very well on overhead and vertical applications. 25 lb. Mortar Mix is rated 4.3 out of 5 by 86. Rated 5 out of 5 by Joe from Mixed very well, adhesion was great.... Mixed very well, adhesion was great. Rated 1 out of 5 by John from It sets too fast. Almost impossible to work with. It sets too fast. Almost impossible to work with. Rated 5 out of 5 by Drew from I used this to repair some small cracks and holes in the stucco on the exterior of my home's foun... I used this to repair some small cracks and holes in the stucco on the exterior of my home's foundation. It's very easy to use, even for someone like me with no prior masonry experience. Pretty tough to beat for the cost of a bag of mix and a small trowel. Highly recommended! Rated 5 out of 5 by HomeDepotCustomer from Worked great for resetting slate steps. ... Worked great for resetting slate steps. Rated 5 out of 5 by Tex from Excellent ! Easy to mix. Flowed beautifully. Set up... Excellent ! Easy to mix. Flowed beautifully. Set up time was perfect. Nice texture. Rated 4 out of 5 by HomeDepotCustomer from Used to fill tack strip holes in floor. Easy to... Used to fill tack strip holes in floor. Easy to mix,use.